Game notes (pdf) for today's game at 6/6 Stanford Cardinal (1-0). Summary: Winning never gets old in Storrs, even when the Huskies are on the road. No. 1 UConn cruised to its 47th straight win with a 102-43 rout of UC Davis in the season opener for both teams Friday night.UConn Sr. All-American Kaleena Mosqueda-Lewis was playing in front of her hometown "Cali" fans and she did not disappoint. KML finished with 30pts. on a UConn record-tying 10 3pt. FG's made as she matched Maya Moore's record for most 3-pointers, which Moore did on Jan. 17, 2009, against Syracuse in Hartford. The Huskies' 18 total 3s tied the school record set in that same game. UConn Jr. All-American Breanna Stewart added 15pts, a career-best 7asts and 6rebs for the hot-shooting Huskies, and the two-time defending NCAA champions went on a 39-0 run spanning 15 minutes, 43 seconds from midway through the first half to Rachel Nagel's 3 at the 13:16 mark of the second for UC Davis. It is believed to be among the biggest runs in UConn program history. Game notes (pdf) for today's game at UC Davis Aggies (0-0). The University of Connecticut women's basketball team has received National Letters of Intent from three student-athletes in the early signing period, as announced by head coach Geno Auriemma on Wednesday. De’Janae Boykin, Katie Lou Samuelson and Napheesa Collier will all join the Huskies for the start of the 2015-16 season. De’Janae Boykin, a 6-foot-3 forward from Springdale, Md., Napheesa Collier, a 6-1 forward from St. Louis, Mo., and Katie Lou Samuelson, a 6-3 wing from Huntington Beach, Calif., each signed a national Letter of Intent Wednesday on the first day of the NCAA early signing period. The trio is ranked among the Top 25 in the class by ESPN HoopGurlz. Samuelson is considered the top player in the class. Collier is ranked No. 7. Boykin is No. 22. And while they will not play at UConn together for another year, they have already achieved success through their affiliation with USA Basketball. Boykin, Collier and Samuelson won the gold medal in the 3×3 competition of the Youth Olympic Games in Nanjing, China in August. Boykin and Samuelson won the gold medal at the FIBA U-17 World Championship in Pilsen, Czech Republic in July and at the 2013 FIBA U-16 World Championship in Cancun, Mexico. Collier also averaged 14.0 points, 3.4 assists, 1.6 steals and a team-high 8.6 rebounds to lead the U.S. to the gold medal at FIBA Americas U-18 Championship for Women at the U.S. Olympic Training Center in Colorado Springs, Colo. in August. For the 10th time in program history, the University of Connecticut women’s basketball team will open its season as the top team in the nation after earning the unanimous No.1 ranking in the Associated Press poll, which was released on Thursday afternoon. They are also the unanimous selection as the top team by the USA Today/ESPN Coaches' poll. It marks the second consecutive year the Huskies have found themselves alone atop the preseason poll and third in the last five years. The other years in which UConn opened the season as the AP’s No. 1 team were 1995-96, 1999-00, 2000-01, 2001-02, 2003-04, 2008-09, 2009-10, 2010-11, and 2013-14. UConn has been ranked No. 1 for a total of 179 weeks in the program's history, the most of any team nationally. In addition, it marks the seventh time the Huskies have been tabbed as the preseason favorite after winning a national championship the prior season. For the second consecutive season, All-American Sr. W Kaleena Mosqueda-Lewis and All-American Jr. F Breanna Stewart (Syracuse, N.Y.) were selected to the Associated Press Preseason All-America Team, as announced on Tuesday afternoon. It marks the first time the same pair of teammates from one team have been selected to the five-member team in multiple seasons. The rest of the team is rounded out by Notre Dame's Jewell Loyd, Duke's Elizabeth Williams and South Carolina's Tiffany Mitchell. Stewart and Loyd were unanimous selections. For the second consecutive season, UConn was picked to win the American Athletic Conference Regular Season Title, garnering 100 points in a vote of the league’s coaches and UConn All-American F Breanna Stewart was honored as the unanimous choice for AAC Preseason Player of the Year, as announced by the conference on Thursday morning. In addition, UConn Fr. G Kia Nurse was selected as the league’s Preseason Freshman of the Year, while UConn All-American Sr. W Kaleena Mosqueda-Lewis and Jr. G Moriah Jefferson were placed on the Preseason All-Conference First Team. Sr. C Kiah Stokes earned a spot on the Preseason All-Conference Second Team. Stewart, who was joined by USF’s Courtney Williams as the only unanimous All-Conference picks, becomes the seventh Husky player, and first since Maya Moore, to be selected as the conference Preseason Player of the Year on multiple occasions. Overall, Connecticut boasts 18 Preseason conference Player of the Year accolades. The 2014 USA Basketball Women’s World Championship Team (6-0) rolled through the 2014 FIBA World Championship undefeated and claimed a second-straight gold medal at the event with a 77-64 win over Spain (5-1) on Sunday night at Fenerbahce Arena in Istanbul, Turkey. The championship, which was the ninth World Championship gold, earned the USA its place in the 2016 Rio de Janeiro Olympic Games, and the USA is now 103-21 all-time in FIBA World Championship play. Former UConn Stars Maya Moore (Minnesota Lynx) led five U.S. players in double-digit scoring with game-high 18 points on her way to earning MVP honors, Tina Charles (New York Liberty) had 10 points and team-high 8 rebounds, and Diana Taurasi (Phoenix Mercury) had a team-high 8 assists. Additionally, Sue Bird (Seattle Storm) is now FIBA’s only four-time women’s World Championship medalist. Current UConn Star Breanna Stewart was also a member of the team as the only college player on the USA roster. Incoming UConn Freshman Kia Nurse helped lead the Canadian National Team to a 5th place finish as the starting PG in all their games including their final win against China with 9 points, 3 rebounds, and 3 assists. The Phoenix Mercury were without star center Brittney Griner. However, they still had former UConn Great G Diana Taurasi. Taurasi scored 14 of her 24 points in the fourth quarter and the Mercury beat the Chicago Sky 87-82 Friday night to complete a three-game sweep of the WNBA Finals for their 3rd championship. Taurasi made big plays as the Sky were threatening to force a Game 4. She hit a tie-breaking 16-foot jumper and was fouled with 14.3 seconds left and made the ensuing free throw to put Phoenix up 85-82. Taurasi shot 4 for 9 on 3's and became the WNBA's all-time leading scorer in the finals. She had some help. After she reached the podium, she slid her MVP trophy over toward her teammate Candice Dupree, a former Sky player who also scored 24 points on 11-for-16 shooting. ''Candice has probably been overlooked her whole career on whatever team she has played on. I've never played with someone that I'm so confident going into a game with. You always know she's going to be able to play. She led us in assists. She never passes, so you knew we were going to win today,'' Taurasi said with a smile. DeWanna Bonner had 12 points and Penny Taylor added 11 for the Mercury, who also won titles in 2007 and 2009. Phoenix, which had a WNBA-record 29 wins during the regular season, shot 49.3 percent overall from the field and never led by more than five in the Game 3 victory. Elena Delle Donne, who battled a back injury during the series, scored 23 points, Sylvia Fowles had 20 points and Allie Quigley had 19 for the Sky. Former UConn Great W Maya Moore of the Minnesota Lynx has been named the 2014 WNBA Most Valuable Player presented by Samsung, the WNBA announced today. Moore received 371 points (including 35 first-place votes) from a national panel of 38 sportswriters and broadcasters. The UConn product and two-time WNBA champion finished as the runner-up to Candace Parker in MVP voting a year ago and finished fourth behind winner Tina Charles in 2012. Former UConn Great Phoenix Mercury G Diana Taurasi finished second in the voting with 242 points (two first-place votes) and Atlanta Dream W Angel McCoughtry finished third with 112 points. Rounding out the top five vote-getters were Los Angeles Sparks F Candace Parker (91 points) and Mercury C Brittney Griner (67 points, one first-place vote), who finished fourth and fifth, respectively. This season, Moore guided the Lynx to a 25-9 record and the Western Conference’s No. 2 seed for the playoffs, despite the club being without injured All-Stars Rebekkah Brunson and Seimone Augustus for 23 and nine games, respectively. For the regular season, Moore played in all 34 games and paced the league in scoring (23.9 ppg), the third-highest average in WNBA history behind the 25.3 ppg and 24.1 ppg by Diana Taurasi in 2006 and 2008, respectively. The WNBA’s top draft pick in 2011, Moore opened the 2014 season by scoring 135 points over her first four outings, marking the most prolific four-game scoring stretch in WNBA history. With that effort, the fourth-year pro became the first player in league history to post four consecutive games of 30 or more points after pouring in 34 points at Washington; 33 vs. Connecticut; a then-career-high 38 at Tulsa; and 30 vs. New York. She went on to finish the regular season with a league-record 12 games of 30-plus points, topping the previous mark of 10 set by Diana Taurasi in 2008. Moore had perhaps her best outing of the season in a 112-108 double-overtime win over the visiting Atlanta Dream on July 22. In the victory, Moore tallied a career-high 48 points, marking the second-highest single-game total in WNBA history. Four games later, in a 84-75 victory at Tulsa on Aug. 2, Moore posted 40 points to break the league record for the most 30-point games in a single season. Moore also finished the season ranked atop the WNBA in made field goals (295) and was second in minutes (34.7 mpg) and free throws made (160). Moore placed eighth in rebounding (8.1 rpg), tied for third in three-point field goals made (62), fourth in free throw percentage (.884, 160-of-181), tied for fourth in steals (1.88 spg), sixth in double-doubles (10), and 20th in assists (3.4 apg). In addition to leading her club in scoring, Moore placed second on the Lynx in rebounding and assists, and third in blocks (0.82 bpg). Moore earned two of the four Western Conference Player of the Month presented by Samsung awards and was named the conference’s Player of the Week five times, becoming the first player in league history to win Player of the Week honors in four consecutive weeks. Players were awarded 10 points for each first-place vote, seven points for each second-place vote, five for third, three for fourth and one for each fifth-place vote received. In honor of being named the WNBA Most Valuable Player presented by Samsung, Moore will receive $15,000 and a specially-designed trophy. Summary: Duel National Champs!!! UConn men won last night vs. Kentucky for their 4th title and the UConn women followed suit tonight finishing up their 5th undefeated season by beating Notre Dame for their NCAA WCBB DI-record 9th National Championship!!!! National Player of the Year and All-American So. F Breanna Stewart led the way with 21pts. on 10-15 shooting and 9rebs., 4asts., and 2blks. while National Defensive Player of the Year and All-American Sr. C Stefanie Dolson added a double-double with 17pts. and 16rebs. to go along with 7asts. and 3blks. All-American Jr. W Kaleena Mosqueda-Lewis overcame an injury-riddled season to have an outstanding postseason and chipped in 18pts., 7rebs., 2asts., and 2stls. to earn a spot on the Final Four All-Tournament Team! Senior All-Americans Stefanie Dolson and Bria Hartley conclude their careers with their 2nd consecutive NCAA titles. Dolson was absolutely brilliant from the tip until she left the game to a giant hug from her coach. She finished just shy of a triple-double with 17pts., 16rebs., 7asts., and 3blks. They will be missed by all (and by their teammates especially). Bria struggled on offense but shut down one of (if not the most) athletic guards in the women's game in Loyd, yet she still finished with 13pts., 2rebs., 3asts., and 1blk as she finished just 6pts shy of 2,000 career points (1,994). They are both EXTRA SPECIAL!!! I am so happy the world got to see just how special and that they got to go out on top. They are going to make whichever WNBA team(s) draft them very, very happy with their selection in next Monday's 2014 WNBA Draft. 2013-14 NCAA Women's Basketball National Champions (Duel Champs with UConn men)!!! Game notes (pdf) for today's NCAA Championship game vs 1-seed Notre Dame Fightin' Irish (37-0). Summary: One more to perfection!!! The Connecticut Huskies are back in a very familiar position, undefeated and playing for a national championship. They'll be going for an unprecedented ninth national championship after UConn All-American and National Player of the Year So. F Breanna Stewart scored 18 points and the Huskies advanced to another title game with a 75-56 win against Stanford on Sunday night. anticipated championship showdown of undefeated teams. It wasn't easy early, though the Huskies (39-0) did their part in setting up the highly anticipated championship showdown of undefeated teams. They will square off against Notre Dame, an 87-61 winner over Maryland, on Tuesday night in the title game. It will be the first women's national title game between unbeaten teams. Game notes (pdf) for today's NCAA Final 4 game vs 2-seed Stanford Cardinal (33-3). The All-American trio of Sr. C Stefanie Dolson, Sr. G Bria Hartley, and So. F Breanna Stewart have all been named to the 2013-14 WBCA Division I Coaches’ All-America Team as announced by the Women’s Basketball Coaches Association today at the Final Four in Nashville, TN. UConn has now had 31 all-time selections to the prestigious team and Stewart is the 18th Husky to be honored on the WBCA All-America squad. Dolson was selected to the squad last year while Hartley earned All-America status in 2012. This marks the ninth time that multiple Huskies were named WBCA All-Americans and the third time three made the squad. Sue Bird, Swin Cash and Diana Taurasi were selected in 2002 while Tina Charles, Renee Montgomery and Maya Moore made the team in 2009. Stewart is only the sixth UConn sophomore to be named to the team along with Svetlana Abrosimova (1998-99), Diana Taurasi (2001-02), Moore (2008-09), Hartley, and Kaleena Mosqueda-Lewis (2012-13). Moore was also selected to the team during her freshman campaign. Today UConn All-American Sr. C Stefanie Dolson was selected as the 2013-14 Senior CLASS Award winner in NCAA Division I women's basketball. The award, chosen by a nationwide vote of Division I women's basketball coaches, national basketball media and fans, is given annually to the most outstanding senior student-athlete in Division I women's basketball. To be eligible for the award, a student-athlete must be classified as an NCAA Division I senior and have notable achievements in four areas of excellence - classroom, community, character and competition. An acronym for Celebrating Loyalty and Achievement for Staying in School®, the Senior CLASS Award focuses on the total student-athlete and encourages students to use their platform in athletics to make a positive impact as leaders in their communities. Dolson is majoring in communication science and plans to graduate in May. She has been named to the Director of Athletics Honor Roll four times. Over her college career, Dolson and her team have visited the Connecticut Children's Hospital and participated in the Walk for Autism. She played a key role in helping raise more than $30,000 for the Kay Yow Cancer Fund. She is fourth in Connecticut history in field goal percentage and blocked shots. She is one of only five players in Connecticut history to reach 1,000 career points and 1,000 career rebounds. She is one of only three Huskies all-time to register a triple-double. With a start on Sunday in the Final Four against Stanford, Dolson would break Stanford's Kayla Pedersen's NCAA DI record for career starts (150). Currently, they are tied at 150. Dolson has started 150 of a possible 152 games in which she has played in during her four year UConn career. She has only not played in ONE game (food poisoning) during her Husky tenure. "I'm extremely honored and I know my family will be so proud and excited," Dolson said. "This award is special because it recognizes more than just basketball and celebrates what student-athletes also do in the classroom and in the community. I take a lot of pride in being a leader on this team, so I'm very happy to be recognized." Today UConn All-American So. F Breanna Stewart was named one of 5 nominees for the Honda Sports Award for basketball as announced by Chris Voelz, Executive Director of the Collegiate Women Sports Awards (CWSA). The other nominees are Sr. G Kayla McBride from Notre Dame, Sr. F Chiney Ogwumike from Stanford, Sr. G Odyssey Sims from Baylor, and Sr. F Alyssa Thomas from Maryland. The Honda Sports Award is presented annually by the CWSA to the top women athletes in 12 NCAA- sanctioned sports and signifies "the best of the best in collegiate athletics". The winner of the sport award becomes a finalist for the Collegiate Woman Athlete of the Year and the prestigious 2014 Honda Cup. The nominees were chosen by a panel of coaches representing the Women's Basketball Coaches Association (WBCA). The Honda Sports award winner for basketball will be announced next week after voting by administrators from over 1,000 NCAA member schools. Each NCAA member institution has a vote. The CWSA presents the Honda Sports Award annually to top women student-athletes in 12 NCAA-sanctioned sports. In December, UConn's Marie Elena Bolles earned the honor in field hockey after leading the Huskies to the 2013 National Championship and earning National Player of the Year recognition. Honda Sports award winners will be presented with the honor during on-campus presentations throughout the year and all Honda Sports award winners become a finalist for the prestigious 2014 Honda Cup award presented in June. Today UConn All-American Sr. C Stefanie Dolson was selected as one of three finalists for WBCA Division I Defensive Player of the Year Award, presented by the United States Marine Corps. Joining Dolson as finalists for the honor are Stanford’s Chiney Ogwumike and Baylor’s Odyssey Sims. The Defensive Player of the Year award honors the best defensive collegiate Division I women's basketball player. All Division I conference defensive players of the year are eligible to be nominated for the award. A selection committee makes the final decision on the winner. Dolson has anchored a UConn defense that leads the country in opponents field goal percentage (30.7 percent) and points allowed (47.4 ppg), both of which approach NCAA single-season records. She is fourth all-time at UConn in blocked shots and swatted a career-high 8 shots in UConn’s Regional Final victory over Texas A&M on March 31 a game in which she tied Stanford's Kayla Pedersen for all-time starts in NCAA DI WCBB history with 150 starts and UConn as a team set the NCAA DI record for blocked shots in a single season with 311 (Baylor 310, 2011-12, 40 games). The 2013-14 American Conference Defensive Player of the Year and Sportsmanship Award winner, she enters the Final Four averaging 12.4ppg and leading the team in rebounding with 9.2rpg to go along with 127 assists. Defensively she has 89 blocks and 38 steals on the season. Dolson also boasts the distinction of joining Kara Wolters as the only two Huskies to four-peat as conference All-Tournament selections. To top the list, the senior recorded just the program’s second triple-double against Oregon on Nov. 20, 2013. The winner will be announced during the WBCA Awards Show, which will be held at 5:30 p.m. CT Monday, April 7, in the Omni Nashville Hotel’s Broadway Ballroom. This event is part of the WBCA National Convention and is held in conjunction with the NCAA® Women's Final Four®. Today UConn So. F Breanna Stewart was named to the 2013-14 John R. Wooden Award All-American Team as announced by the Los Angeles Athletics Club. Voting by college basketball media members from throughout the nation took place March 12-25, which allowed voters to take into account the first two rounds of the NCAA Tournament. The All-American Team is comprised of the five student-athletes who received the highest point total over that period. All players must maintain at least a 2.0 cumulative GPA to be eligible. The 5 members of this years John R. Wooden Award All-American Team are also the 5 finalists for the 2013-14 John R. Wooden Award. The winner of the 2013-14 John R. Wooden Award will be announced as part of the 38th annual Wooden Award Gala presented by Wendy’s weekend April 10-12, 2014 at The Los Angeles Athletic Club. The event will honor the Men's and Women's Wooden Award winners, and will include the presentation of the Wooden Award All American Teams and the Legends of Coaching Award, this year given to Stanford Head Women’s Basketball Coach Tara VanDerveer. The American Athletic Conference Player of the Year, Stewart becomes the seventh Husky selected as a Wooden Award All-American since the team’s inception in 2004. Former UConn star Maya Moore is the only Husky to earn the honor on multiple occasions after making the team in every one of her distinguished four years at Connecticut. Stewart joins Moore, Tina Charles, Renee Montgomery and Diana Taurasi as UConn players to receive the honor. A unanimous AP First Team All-American selection, Stewart leads the Huskies with 19.4 points per game and ranks second on the UConn roster in rebounding with 8.1 boards per contest. Her 738 points this season are fourth most in program history and represent the second highest total by a sophomore since Maya Moore netted 754 in 2009-10. Stewart not only delivers on the offensive end, but the 6-4 forward leads the squad with 106 blocks on the season, helping UConn set a new NCAA single-season team record for rejections with 313. For the first time since the 2001-02 season and the second time in program history, five Huskies have earned All-American recognition from the Associated Press as announced by the organization Tuesday morning. UConn All-American So. F Breanna Stewart headlined the squad as a unanimous First Team AP All-American selection. The Senior All-American duo of G Bria Hartley and C Stefanie Dolson earned Second Team choices. UConn So. G Moriah Jefferson and All-American Jr. W Kaleena Mosqueda-Lewis were recognized with Honorable Mention honors. The feat marks the second time in program history that five Connecticut players have received AP recognition. In 2001-02, the combination of Sue Bird, Swin Cash, Diana Taurasi, Asjha Jones and Tamika Williams collected five AP All-American accolades en route to winning the first of what would be three consecutive National Championships. Summary: UConn won its 44th straight game and are now headed to Nashville, TN to compete in their NCAA WCBB DI-record 7th straight Final Four (and 15th overall). Led by Lincoln Regional MOP and UConn All-American Jr. W Kaleena Mosqueda-Lewis' 17pts and 7rebs as well as All-American Sr. C Stefanie Dolson's 14pts., 10rebs, and career-high 8 blocks, UConn again pulled away early in the 2nd half to defeat Texas A&M, 69-54. In this game, Dolson also tied Stanford's Kayla Pedersen for all-time starts in NCAA DI WCBB history with 150 starts and UConn as a team set the NCAA DI record for blocked shots in a single season with 311 (Baylor 310, 2011-12, 40 games). The trio of All-American Sr. C Stefanie Dolson, Sr. G Bria Hartley, and So. F Breanna Stewart have earned spots on the 10-member 2013-14 United States Basketball Writers Association All-America Team as announced by the USBWA today. The USBWA Women's All-America Team is the nation's best ten players, regardless of position, as selected by the USBWA membership based on regular-season performance. These ten standouts are finalists for the USBWA's Ann Meyers Drysdale Award as the national player of the year, which will be announced Sunday at Bridgestone Arena in Nashville, Tenn., at 3:30 p.m. ET prior to the start of the NCAA Women's Final Four. Dolson earns her second-straight USBWA All-America Team selection while Hartley and Stewart earn the honor for the first time. Huskies have had at least one selection on the 10-member team in six of the last seven seasons. Dolson is the fifh Husky to earn multiple selections to the team, which began in 1996, joining former UConn Greats Nykesha Sales, Svetlana Abrosimova, Diana Taurasi, and Maya Moore. Game notes (pdf) for today's NCAA Elite 8 game vs 3-seed Texas A&M Aggies (27-8). Summary: UConn All-American Jr. W Kaleena Mosqueda-Lewis followed up her triple-double with a double-double of 19pts and 13rebs (career-high 8 offensive) as UConn pulled away midway through the SECOND half to defeat BYU, 70-51. UConn season scoring leaders Breanna Stewart and Bria Hartley overcame slow starts, with Stewart having 12 of her 16 in the second half and Hartley all 12 after halftime. At the end of the day, it wasn't pretty or easy (it isn't supposed to be), but a win is a win and UConn now moves onto the Elite 8 and awaits the winner of the Texas A&M-DePaul winner. Game notes (pdf) for today's NCAA Sweet 16 game vs 12-seed BYU Cougars (23-9). The UConn trio of All-American Sr. C Stefanie Dolson, All-American Sr. G Bria Hartley, and All-American candidate So. F Breanna Stewart have been named as finalists for the 2014 Wade Trophy, which is presented annually to the nation's most outstanding Division I women's basketball player as announced on Thursday. The candidates were selected by a vote of committee members consisting of leading basketball coaches, journalists and administrators. The committee will select the winner of The Wade Trophy from among the 12 finalists who also are named to the 10-member WBCA NCAA Division I Coaches' All-America Team when it is chosen in April. The winner will be announced during the WBCA Awards Show, which will be held at 6:30 p.m. ET Monday, April 7, 2014. The UConn trio of All-American Sr. C Stefanie Dolson, All-American Sr. G Bria Hartley, and All-American candidate So. F Breanna Stewart have been selected to the 2013-14 All-Region 1 Team as announced by the Women’s Basketball Coaches Association (WBCA) on Tuesday, March 25. This marks the second selection for both Dolson (2013) and Hartley (2012) and the first for Stewart. The WBCA All-America selection committee will select the 10-member WBCA Division I Coaches’ All-America Team from these 52 All-Region picks and will be announced on Saturday, April 5, 2014 during the Final Four in Nashville, TN. Today UConn women’s basketball head coach Geno Auriemma has been selected as the 2013-14 Region 1 Coach of the Year, as announced by the Women’s Basketball Coaches Association (WBCA). Auriemma is one of eight Russell Athletic/Regional Coaches of the Year and is now a finalist for the inaugural Pat Summitt Trophy to be presented to the 2014 Russell Athletic/WBCA NCAA Division I National Coach of the Year. The other seven finalists for the award are Notre Dame’s Muffet McGraw (Region 2), South Carolina’s Dawn Staley (Region 3), Bowling Green’s Jennifer Roos (Region 4), Baylor’s Kim Mulkey (Region 5), Indiana’s Curt Miller (Region 6), Colorado State’s Ryun Williams (Region 7) and Oregon State’s Scott Rueck (Region 8). The 2014 Russell Athletic/WBCA NCAA Division I National Coach of the Year will be announced during the fourth annual WBCA Awards Show on Monday, April 7, in the Omni Nashville Hotel’s Broadway Ballroom. This event is part of the WBCA National Convention and is held in conjunction with the NCAA Women’s Final Four. Summary: UConn All-American Jr. W Kaleena Mosqueda-Lewis has struggled this season with injury and illness. But everything felt fine on Tuesday night. She recorded UConn's first ever triple-double in a NCAA Tournament game as she scored 20 points, pulled down 10 rebounds and had 10 assists to lead the Huskies to a 91-52 rout of Saint Joseph's in the second round of the NCAA tournament. It was the second triple double for UConn this year, the third in program history, and just the 14th in the history of the women's NCAA tournament. She led five players in double figures for the top-ranked Huskies, who won their 42nd straight game. UConn All-American candidate So. F Breanna Stewart added 21 points and 11 rebounds, and All-American Sr. G Bria Hartley also chipped in 20 points for the defending national champions, who are trying to win a record ninth NCAA tournament. Game notes (pdf) for today's NCAA 2nd Rd game vs 9-seed St. Joseph's Hawks (23-9). Summary: UConn's players had a couple of presents for coach Geno Auriemma on his 60th birthday. The first was a video in which they altered the words to the Commodores classic song "Brick House" to have a little fun at his expense. The second was an 87-44 rout of Prairie View A&M on Sunday, giving Auriemma his 92nd NCAA tournament win. UConn All-American candidate So. F Breanna Stewart led a balanced offense with 19 points and 10 rebounds to lead five Huskies in double figures. Fellow So. G Moriah Jefferson had 14 points, four assists and five steals. Game notes (pdf) for today's NCAA 1st Rd game vs 16-seed Prairie View A&M (14-17). UConn All-American candidate So. F Breanna Stewart has been selected as one of four finalists for the 2014 Naismith Trophy, which is awarded annually to the nation’s top collegiate basketball player, as announced by the Atlanta Tipoff Club. The fan voting component of the award’s selection process will begin next week. Stewart is joined by Notre Dame’s Kayla McBride, Stanford’s Chiney Ogwumike and Baylor’s Odyssey Sims. The finalists were chosen by the Atlanta Tipoff Club’s National Voting Academy, which determined that the player performances throughout the 2013-14 regular season stood out among a host of great women’s basketball players. The 2014 Naismith Women’s College Player of the Year presented by AT&T will be awarded to one of these four finalists on April 7, 2014, in Nashville, TN. For the 10th consecutive year, fans will have the opportunity to vote for the player of their choice and help determine the 2014 Naismith Trophy winner. Beginning March 24 and running through April 5 fans can cast their vote through the online and mobile optimized site www.NaismithVote.com. The fan vote represents 25 percent of the selection process – the largest fan impact of any collegiate basketball award. The 1-seed Connecticut Huskies will face 16-seed SWAC Champion Prairie View A&M (14-17) at Gampel Pavilion in Storrs, CT on Sunday, March 23 at 8:00pm (ET) on ESPN. Today UConn So. F Breanna Stewart was selected by a panel of WCBB media members as the espnW 2013-14 WCBB National Player of the Year by espnW while senior center Stefanie Dolson and senior guard Bria Hartley each earned espnW All-America status, as announced on Friday. UConn led the way with 3 players named to each of the two 5-player teams as Stewart was selected as a First Team All-American while Dolson and Hartley each earned Second Team honors. All 3 players were unanimous selections. Today UConn Sr. All-American G Bria Hartley was selected as one of 19 nominees for the 2014 James E. Sullivan Award, which honors the nation’s outstanding amateur athlete, as announced by the Amateur Athletic Union (AAU). Cast your vote for Bria at aausports.org! Tuesday marks the first day of voting to find the winner of the 2013 AAU Sullivan Award. Voting is open to the public and will account for one-third of the athlete’s overall score. The nominees were nominated by someone who thought they fit the requirements of outstanding athletic ability, strong character, leadership and sportsmanship. Three finalists will be named no later than March 28th and the winner will be announced at an awards ceremony on Friday, April 11 at the AAU National Headquarters in Orlando, FL. The Sullivan Award has been presented annually since 1930, and is based on character, leadership and sportsmanship. Notable recipients of the AAU Sullivan Award include: Mark Spitz, Jackie Joyner-Kersee, Florence Joyner, Peyton Manning, Michael Phelps, J.J. Redick, Tim Tebow, Shawn Johnson and Missy Franklin. Summary: UConn So. sensation and All-American candidate F Breanna Stewart was everywhere on both sides of the court (even ending up with a SportsCenter Top 10 (#9 to be exact) highlight block on her way to being named the inaugural American Tournament MVP as she led UConn to yet another 20-point victory over Louisville, 72-52. Stewart was helped by fellow All-Tournament members UConn All-Americans Sr. G Bria Hartley (16 points and 6 assists), Sr. C Stefanie Dolson (10 points and 16 rebounds), and Jr. W Kaleena Mosqueda-Lewis (13 points and 4 rebounds). The Huskies have now won 40 straight games - the third-longest streak in school history. It was the third straight game that UConn put a team away by the end of the first half. Shoni Schimmel led Louisville with 20 points, but was 7 for 25 from the field. She had little help as no other Cardinals player reached double figures. Once again, Louisville had no answer for the Huskies, losing for the third time this season and the 16th straight time overall. The Cardinals have only beaten the Huskies once and that was in the first meeting between the schools back in 1993. 2014 American Athletic Conference Tournament Champions!!! UConn nearly swept the American Athletic Conference's Women's Basketball major awards as sophomore forward Breanna Stewart was named the 2013-14 American Player of the Year and Head Coach Geno Auriemma received 2013-14 American Coach of the Year honors. Rutgers guard Tyler Scaife took home the American Freshman of the Year award. Stewart, the American Preseason Player of the Year and AP Preseason All-American, averaged 8.5 rebounds and a team-best 19.8 points per game in conference play. The Syracuse, N.Y. native finished second in the league in scoring and become the fifth sophomore in UConn history to hit the 1,000 career-point mark. Stewart was a unanimous all-conference first team selection and led her team to the inaugural American regular-season championship. She was named the 2013 USA Basketball Female Athlete of the Year and is a finalist for the Naismith, Wade and Wooden Awards. In his 29th year of coaching, Auriemma led his team to an unbeaten regular season and the inaugural league title. His squad finished 31-0 for their ninth-consecutive 30-win season and is ranked No. 1 in both the Associated Press and USA Today Coaches Polls. His team boasts three Naismith National Semifinalists, four players on the Wade Trophy Watch List and two Nancy Lieberman Award finalists. 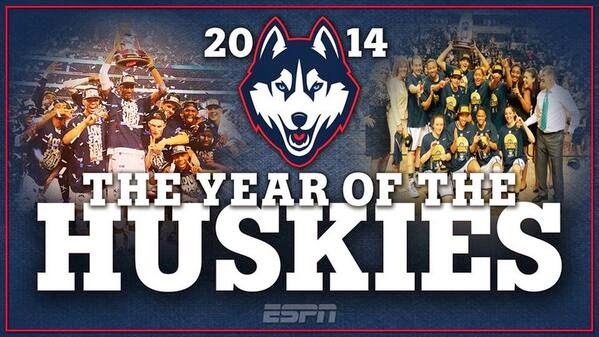 UConn has won 37 conference championships and are currently on a 37-game win streak dating back to last season. The streak is the third longest in program history. The UConn women’s basketball team placed seven players on American Athletic Conference regular season teams in awards announced Thursday afternoon by the league. Stefanie Dolson headlined the group, earning Defensive Player of the Year, the American Sportsmanshp Award and a spot on the All-Conference First Team. Joining Dolson as First Team selections were Bria Hartley, Moriah Jefferson and Breanna Stewart. Juniors Kaleena Mosqueda-Lewis and Kiah Stokes landed on the All-Conference Second Team while rookie Saniya Chong received was an All-Freshman team choice. 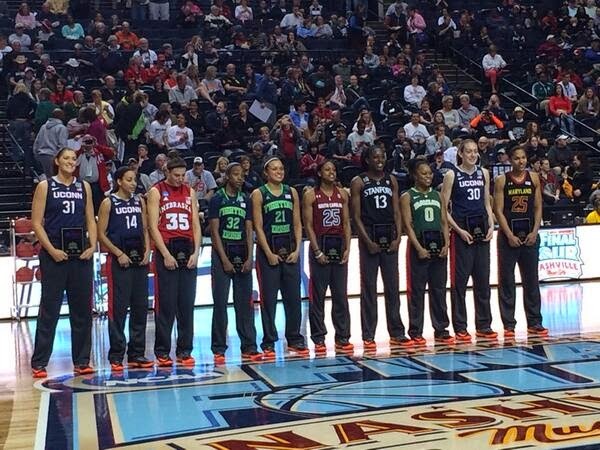 UConn All-Americans Sr. C Stefanie Dolson and Sr. G Bria Hartley as well as All-American candidate So. F Breanna Stewart have each been selected to the final ballot for the 2014 John R. Wooden Award, as announced today by the Los Angeles Athletic Club. Maya Moore (2009, 2011) and Tina Charles (2010) are former Huskies to earn the prestigious award. UConn was one of only two schools to place multiple student-athletes on the 15-member ballot as Notre Dame placed two. UConn So. All-American candidate F Breanna Stewart was named the American Player of the Week for the fourth time this season after she combined for 65 points (21.6 per game) in a 3-0 stretch for the Huskies that included conference wins over SMU, No. 24 Rutgers and No. 3 Louisville.